AGT's Lys Agnes is going to Hollywood. Did you survive three hours of America's Got Talent on Tuesday? As the opening of the show said, "Now It Gets Serious" - and Vegas Week means some will go on and many will go home. Here's what happened on America's Got Talent Season 6 - Final Auditions and Las Vegas on July 5, 2011. For the first hour of AGT on Tuesday, there was more from the auditions in New York. No one too notable to even mention. Then, the second hour took us to the Las Vegas auditions. These are tough because there is no audience. Performers are doing their best for only the three judges. Planet Hollywood on the Las Vegas Strip is the site of this year's Las Vegas week. Piers Morgan started off by saying that not everyone will get a chance to perform in Las Vegas. I thought they were sending people home, but no, they sent ten acts directly through to Hollywood, the next step. Only 48 acts will make it to the live shows in Hollywood. With ten already on the way, that leaves 38 slots to fill - and there are more than 100 acts. 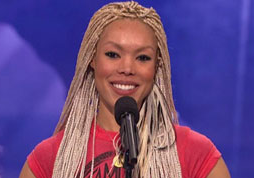 Lys Agnes - a pretty black woman with blonde tiny braids. She sings opera. Very impressive. Illuminations - a high-tech performance act, reminiscent of last year's Fighting Gravity. Silhouettes - an all-girl group of students that performs behind a curtain and makes amazing, what else - silhouettes. Performers were then divided into the ones that the judges wanted to see on the first America's Got Talent Vegas Week night - which included about 60 acts. The rest of the performers were told they would be on standby. They get their shot on the second night of AGT Vegas Week. Acts performed by category. There were 12 categories covered in the two-hour Vegas Week show. No one was told until the end if they were going on to Hollywood, but a few were sent home immediately following their performances. Below is a list that includes a few highlights from the different groups. Danger Groups - Not sure who made it. Vocal Groups - Fourplay, a foursome of black women sang off-key and were sent home. Acrobats - actually, pole dancers - Steve went to Hollywood - Soleil went home. Magicians - Only Scott Alexander made it through to Hollywood. The guy with the cat and Michael Turco went home. Animal Acts - the dog and two bird act did not do well, but one talking parrot made it to Hollywood. Classical Singers - The black woman with the muscles went home and poor Cindy, the 42 year-old homemaker. She did a bad job. Ooops. Landau, the car washer who sings Sinatra is on his way to Hollywood. Dance Acts - Fatally Unikue made it, the others were sent home. Female Singers - Two women went home, but Danni Shay, who blew it by performing and messing up a song she wrote was given a rare second chance and made it to Hollywood. Comedians - Howie said, "You cannot do comedy alone" - and it is extremely hard to perform stand-up to an empty room. I know, I've been there "Free chair night" is what I called it. Geechy Guy - who I remember from my stand-up days - powered through enough one-liners to get to the next step. Novelty Acts - The giant gnomes and the Kinetic King, the guy with the multi-colored tongue depressors built to explode made it. Male Singers - Only the black guy who has been performing since he was three years old made it. Wednesday, the standby acts get their shot at the few spots left. Also, voting for the YouTube acts ends July 8th at 9 pm ET. Click here for YouTube voting. Whew - there was a lot to cover. And see the comments for additional information about acts that made it. Info provided by a friend of the blog AGT-Fan. That's the wrap for America's Got Talent Season 6 - Las Vegas - Tuesday, July 5, 2011. It will be a busy night tonight, too. Bands; PopLyfe made it. The young musicians with the female front. Scott Alexander, magician advanced, not sure about Seth Grabel. Danger, Frank Miles, Charles Peachock and the BMX bike group Yellow Team. Landau Murphy, The Chairman of the Board in Dreads, made it. @AGT-Fan - Thanks so much. The show was moving so fast that I missed a few things. I appreciate the backup. Yes, you are correct about Steve Alexander. My mistake. I was going through old notes and I knew it was an "S" - Not Seth... STEVE. Anything else you want to add, please do so. Charles performed with the neon, but it was marginal, now he performs with fire and I was too afraid to see what he would do. He really should have been allowed to go straight on. The motor cycle riding family was not that impressive. He should have taken their spot. I really wish I had started watching 5 years ago because I really like this show a lot but now I record it every week and watch it when I’m on the go with the help of my DISH Network employee Sling adapter. http://bit.ly/k80U6m It’s awesome because I save time at home I could be spending with my family but still see my favorite summer show. I even got it for free when I signed up for my account recently which was totally a surprise only now I heard current customers can get it free too. @Byron - are you a fan or a DISH TV salesperson? Fourplay is a group of ASIAN* women, not African-American.